What I have always loved about Season Of Mist is there willingness to do a wide variety of wonderfully weird stuff just because they know it is good. 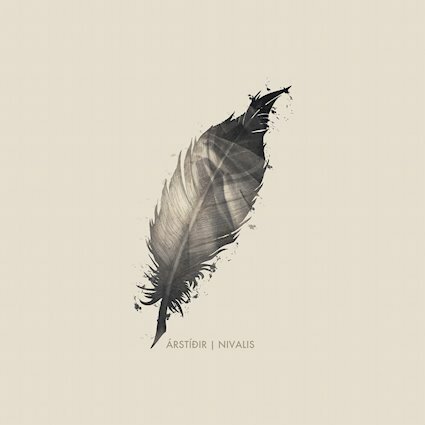 Such is the case with Arstidir whose new record, the inimitable Nivalis is a veritable odyssey seeing the band leap from peak to peak, from post rock poetry to progressive brilliance, from Simon & Garfunkel fueled choruses to inescapable comparisons to fellow Icelanders Sigur Ros. Yet through it all they are wholly their own thing and altogether fascinating. There are a lot of deep and emotionally powerful levels to what is going on throughout Nivalis. It's a record that gives no quarter and demands a lot from the listener. Not only that but it is wonderfully inspiring, the sonic journey that you take is not just potent but one fueled by a deep variety of influences and some truly next level songwriting. The way these tracks resonate within the listener is thrilling and the lush instrumentations, unafraid to experiment and always excited to expand seem to keep adding to what Arstidir have been able to piece together here. It's a sonic temple to a world we have forgotten. You are going to be mesmerized by Nivalis there is no way around it. This is a record that itches all sorts of unique creative desires and seems to continually push itself towards bold new heights. Arstidir have never been a band to scale back their vision, but they also aren't guilt of trying to go too far. Instead this is a potent step forward with expansive ideas but it never feels overambitious. Instead the groups unique brand of pop influenced indie folk. There are gorgeous ideas here and the band is starting to flourish for real. Get ready to fall in love.